When you teach writing in college, your students create things that are unreal. During the semester, you, the teacher, are usually their only reader. You read your students’ essays, assign a grade, offer feedback, and then the essay disappears, forgotten by all. The essay pretends to speak to real concerns, to a real readership. But both the creator and the reader know that this is fake. The essay acts as though it is a real engine of persuasion and information. The professor grades it on the basis of how its imagined readership, whether scholarly or public, would respond to its claims, structure, and voice. In reality, however, there is no public, and there is no engine, because the essay is probably only going to be read once. By you. And this is very frustrating. A quick story about my childhood, and my training with swords. When I was a small boy, my parents sent me to an expensive school not far from our house. This is a luxury denied almost everyone in the world, and I can confirm that it was a very valuable one. I am very, very lucky. There were frustrations, of course. That school, at least when I attended it, was not ideal. I don’t really think I was happy there. But these are small complaints. Everyone in the world should have the opportunity to be unhappy in a school that good. Anyway. 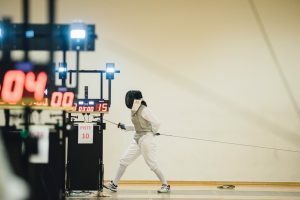 One of the benefits of going to that expensive school in London: pupils had the choice of continuing to study PE (physical education, gym class etc) — or take fencing classes. A fencing instructor visited every week and gave lessons in foil, epeé, and saber. Of course, I opted for fencing class. But for an entire year, I was the only student who did. And so, for what felt like an incredible period of time, perhaps an ice age or Egyptian dynasty, I alone retrieved my helmet and weapon from the fencing equipment cupboard, and entered the room to the side of the main gym, and began my solo class. It only now occurs to me, writing this post, how immensely unrewarding these sessions must have been for the instructor. I was not a good fencing student. I have always been terrible at anything involving hand-eye coordination. I was never this good. So there was surely no thrill of discovery for my teacher, no chance to stretch his abilities. Probably the situation was an embarrassment to both the school and the teacher. Was he paid a fixed sum, regardless of the number of fencing enrollees? Did he worry, as a result, as though he was cheating the school of its money’s worth? I don’t know. However, even if the financial arrangement was completely clear and satisfactory, I can imagine that the lessons were not a source of pride. He was teaching a fake skill. I never opposed anyone but him. I never used — I have never used — an epeé in any situation except his class. It’s not the best way to be a teacher. The singing master loves song. Any chance to teach is a rewarding one. But the best opportunities to teach, surely, involve real songs, and teaching essay writing in a classroom often feels like teaching not quite “real” words. There are no easy solutions to this problem. Many classrooms do try to inject a level of public writing into their curricula. And yet many students are unwilling (wisely) to subject their writing to actual public scrutiny. They don’t want to provoke the people the essay claims to want to provoke, because the response would be deafening, even dangerous. And I feel sympathy for that fear. They are, after all, just students. This conundrum perhaps explain why the essay-writing workshop is so appealing to teachers of writing. A workshop offers a writing teacher a solution to the above problem, a middle path. On the one hand, it offers the chance to expose student work to multiple readers, to test the essay’s approach and execution against “actual” reading, not just the teacher’s eye. And it does so without anyone’s work leaving the relative safety of the writing classroom. If you have never attended a “writing workshop” before, the principle is simple. It is a class that can, in theory, teach itself. The student brings in paper copies of their essay, enough for everyone in the class to read, and the other students read it, and respond with feedback. Generally speaking, the workshopee remains silent during the feedback session, merely taking notes on what she hears. The teacher lets the students lead the session, perhaps picking one person to speak after another, perhaps checking anyone who steps too far out of line — but the students talk the most. The teacher sums everything up at the end for the listening workshopee. The student then goes home and uses the feedback to revise the essay. When a workshop goes well, it helps students re-see their work. 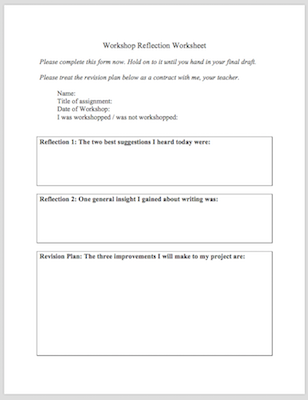 When a workshop goes well, it quickly generates a huge amount of feedback for students to take away, mull over, and incorporate into their revision plans. When a workshop goes well, students get valuable practice in evaluating other writers’ work, and seeing what works and what does not. I know that for myself, writing workshops have been immensely valuable. They have helped me build an imagined reader in my mind. It’s extremely powerful to experience a room full of people attempting to come to common ground on what needs to improved about one’s work. Workshops tend to be a lot of fun, too, for the writer, even if they are not easy on the nerves. The readers get the chance to talk; the workshopee is for a brief time the focus of attention. I sometimes think many students sign up for creative writing classes because they (correctly) suspect the class will treat them like they are important, worthwhile. However, it’s also obvious that a writing workshop can go wrong, badly wrong. What follows is my advice for running a successful workshop: a process for training a writing class, over the course of a term or semester, to teach itself. You have assumed students know how to give useful feedback and hear useful feedback. Students sometimes say horrible, brutal things without realising what they are doing. If the workshop starts with critique from minute-one, with no warm-up or prelude, many students will feel too shy or stressed to share their thoughts. It’s hard to give someone harsh advice. As a result, you can end up with a small minority of the class speaking while everyone else watches in silence. This small minority is frequently white and male. The workshopee may have no idea what to do with all the feedback she has acquired. After teaching several workshops where all of the above problems occurred, I now never, ever, ever begin a workshop without setting out my expectations — both before and after. I also use a specific three-part step by step process to guide students through the work of giving useful feedback. I learned this three-stage process from the essayist David Shields, and I find it works really well. Step One: Before the workshop. The class session before the first workshop, I explain the key rules: students will bring in a certain number of copies of their work, if they are picked they will not speak much during the workshop discussion, and that they should take notes of all the advice they receive. I also guide students to look for two or three qualities that a good version of the assignment should have: in other words, I give a short grading rubric for them to use. I encourage students to be respectful but forthright. Often students hedge their feedback by using qualifiers (“maybe you could”) or other such diminishments (“this needs a little more”). I advise them to be kind but clear. Step Two: During the workshop. Once everyone has brought in a draft, and someone has either volunteered or I have picked them to be the first workshopee, I explain the three part process we will follow. Step 3: Critique. Now we offer our feedback on what didn’t work for us, what was not clear, and what the writer should expand. The good news is that because we previously described what the piece was, and praised everything we liked, this part of the workshop should now move quickly and clearly. I often guide this part of the session, helping the class to stay on one crucial topic, asking students to build on one initial comment. Step Three: After the workshop. It may be worthwhile handing out a “revision sheet” to both the workshopee (s) and the entire class after the workshop session. This sheet asks the student to write down what they learned during the workshop, what advice really stuck with them, and what revisions they now plan to make. This work sheet is available to download here (I’ll mention it again at the end of this post). If you use a post-workshop worksheet like this, it is important to treat it like a contract. If a student agrees that x, y, and z aspects of their essay need to change, then they should understand that their final grade will be dependent on those changes manifesting in their final draft. I then like to end class a few minutes early, so I can go through the worksheet with the workshopped student and make sure we both understand what the revision plan will now be. Advanced Level: The students workshop each other. In some creative writing courses, workshops take up the entire semester. Students spend the entire course giving feedback and receiving it. In a class like this, students are able to hand in and be workshopped two or three times each. However, in an essay-writing or professional-skills course, such an approach is probably not practical. You actually have to teach them the skills they need to make the things they will workshop. As a result, the teacher simply doesn’t have time to run full-class workshops for every single student. In other words: periodically through the semester, when an assignment has been drafted, you break the room up into small groups and have them workshop each other. The smaller the group, the quicker they will work, but the worse the conversation will be. So there is probably an optimal group size, of 4-5 students, that allows for a lot of essays to be reviewed but people keep talking. You have already run two or three full-class workshops for that genre of work, with you as the leader, so that students know what the score is. They know how to workshop and they also know what to look for in a particular project or style of writing. You ask each group to appoint a workshop leader for each discussion, someone who guides their group through the three stages of the workshop (description, praise, critique), and who prompts quiet people to speak. You should encourage those group leaders to exercise absolute, caesar-like authority: they should feel like they can ask questions of their class mates and steer the discussion. If time is short, this group leader might also need to track time and make sure things move quickly. You practise very active listening. I like to wander between groups, looking and listening for pockets of odd silence, raised voices, stressed-out eyes. I can’t be in every group, but I can look for problems and try to help out. If three groups are talking happily, and one is silent, I might even join that fourth group as a participant and see if that helps. In small group workshops, where you are not supervising every discussion, it’s particularly important to have a formal system of reflection at the end of the session. Students cannot just be left to figure out what they should do; it’s the teacher’s job to facilitate a process of reflection and selection. At the end of the class, everyone should take a minute to reflect on what they heard, what lessons they absorbed, and how they plan to adopt those insights into their own writing. I think a formal handout works best for this kind of process. You can get a copy of the handout I use, below. It’s pretty basic, but I’ve uploaded the Word doc, not a pdf, so you can alter it as you please. I hope this advice has been helpful. What do you do to ensure successful writing workshops? Success! Now check your email to download the file.